Another good week - maintained! whew - it was a tough week with birthday parties and getting together with friends. How I maintained this week: portion control. Which is VERY hard for me! My friend Gail posted last week, and asked me a great question: "I need to get back at WW - any hints on how to get going again?" Do this before the holidays start. Would it really be easier if you started in January after you gained an additional 10 pounds? Maybe by starting now you only gain 5 or less - something to think about. Go to the Weight Watcher website and find a meeting that you can commit to once a week. It's also important to find a meeting that has a great group leader. STAY for the meeting, it's important to know that you are not alone. While you are waiting to go to your meeting next week - clean out your pantry/fridge. Get rid of food that gets you into trouble. Plus it's the perfect time of year to donate to your local food bank! Then go to the grocery store and buy fruits and vegetables. Cut them up for snacking. This is where the planning is key. I would do much better if I would stick to a plan when snacking. So how do you handle portion control now? Or what will you change this week to help you with portion control? We are going to be using smaller plates when eating at home. I just inherited a full set of Kirk's grandmother's china. The dinner plate is 10" across with an eating area of 7". My dishes now are 11" across with a 10" eating area. Plus I am excited to be using something that would normally be in storage. 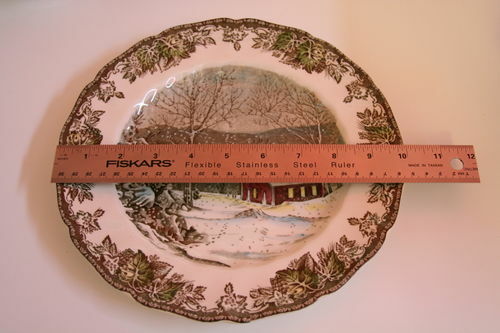 I am on the hunt for some more everyday plates in this size. The set I inherited above is definitely winter months only - especially with the snow scenes. This is the Friendly Village set by Johnson Brothers in England. I have been drooling over Heath Ceramics Coupe line and the Denby Linen line. Should probably buy a lottery ticket this week.